Jungle Red Writers: Laura DiSilverio--Tara, Manderley and . . . the Chateau du Cygne Noir? Laura DiSilverio--Tara, Manderley and . . . the Chateau du Cygne Noir? DEBORAH CROMBIE: If we are celebrating the advent of fall, what better way to do it than to curl up with a good book? Not just any book, but the kind of suspense novel that got many of us reading, thrilling and enchanting us with a creepy setting, suspicious characters, and a heroine whose life might depend on figuring out the mystery just in time. Well, you can make your cup of hot chocolate (or pumpkin latte) and enjoy THAT LAST WEEKEND, the brand new novel from our Jungle Red friend Laura DiSilverio! Laura gives us all of the above, plus not just one protagonist but four, searching for a murderer in the melancholy Chateau du Cygne Noir. AND Laura is giving away a copy to one of our commenters! Ten years later, Laurel Muir returns to the castle for the first time since the accident, hoping to reconnect with her friends and lay the past to rest. When a murderer strikes, it rips open old wounds and forces the women to admit there's a killer in their midst. The remaining friends make a pact to unearth the truth, but suspicion, doubt, and old secrets threaten to tear them apart. Unsure who to trust, Laurel puts herself in harm's way, risking it all for friendship and long-delayed justice. Just reading this gives me goosebumps. Laura, tell us more. 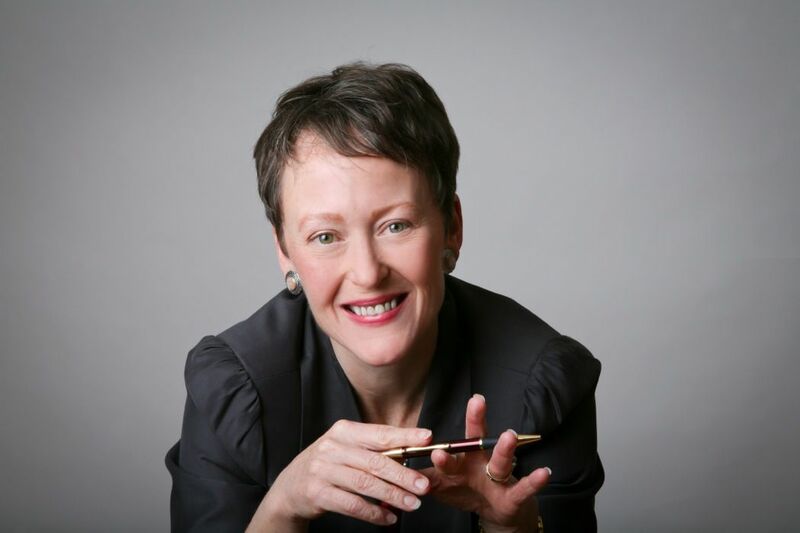 LAURA DISILVERIO: In my high school years and early twenties, I devoured gothic novels where young governesses or secretaries accepted positions at moody mansions in remote locales and stumbled into secrets and dire peril. Murder, sinister retainers, ghosts and brooding men were staples of these books. I loved Daphne duMaurier, Dorothy Eden, Joan Aiken, Mary Stewart . . . I could go on and on. Gothic novels seem to have fallen out of favor, alas, but I have borrowed some elements for my latest release, THAT LAST WEEKEND, including the atmospheric old house. The Chateau du Cygne Noir bed and breakfast sign appeared suddenly. It featured elegant white script on a lavender background with a black swan. Wide stone pillars on either side of the driveway supported the decorative iron gate that was always open, and she turned in gingerly. The driveway’s sharp curves hid the castle until she came around the last bend and it burst into view. Its warm yellow stone seemed to soak up the sunlight and beam it back. Arched windows with their numerous small panes glinted. She’d loved the place the moment she set eyes on it that first spring break, almost as much as Vangie did. It had presence, a personality, the way the House of Usher or Manderley did. She knew Dawn would say “your English major is showing” if she shared her thoughts. The house wasn’t brooding, like Usher’s house, nor was it grand and forbidding like Rebecca’s Manderley, its stony façade repelling the nameless heroine. If Geneva were to assign an emotion to the chateau, she’d have to go with sad. No … melancholy. The stalwart home that should have been surrounded by fields of lavender and wine grapes, that had presided over the siege of Tournai and absorbed the blood of its scion on the cobbled courtyard and the screams of maidservants treated the way ill-disciplined armies treated women, felt displaced in this verdant corner of the New World. Did you read gothic novels? What were your faves? What houses/castles/mansions do you remember from books you've read? Do you ever think of the setting as a character in the novel? I'll be here to chat with you all day, and one lucky commenter will get a free copy of THAT LAST WEEKEND! Laura DiSilverio is the bestselling and award-winning author of 21 novels, including multiple mystery series and standalone suspense novels, and a Young Adult dystopian trilogy. She lives in Colorado where she is trying (with lots of home projects and Haagen Dazs) to come to terms with being an empty nester. DEBS: It seems to me that the gothic suspense novel is making a comeback, which couldn't make me happier. So interested to hear who else loved books like this. Two of my favorite gothic novels: “Rebecca” and “Flowers in the Attic” . . . Houses/castles/mansions: Thornfield Hall in “Jane Eyre” and Manderley in “Rebecca” . . . I love stories where the setting actually becomes a character . 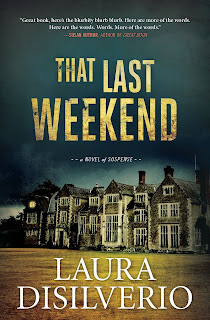 . . I’m looking forward to reading “That Last Weekend” . . . . Thanks, Joan. Somehow I missed "Flowers in the Attic." I'll have to find a copy and give it a read. This sounds so fabulous! I pre-ordered long ago… So my opt should be arriving any minute now! And this is such a terrific idea… how about the Turn of the Screw for a scary house with possibly-scary inhabitants? Congratulations on yet another mad success! It was fun to write, although keeping four viewpoints characters and timelines in the present and past straight made my head spin some days. This book sounds right up my alley! "Melancholy" house. Women's friendships. Secrets from the past... Congratulations, Laura! I hope you enjoy it, Hallie. So great to see you in NYC. Cool, Laura! I love this kind of book. Perhaps you'll lead a movement toward modernized gothics. Congratulations! I don't know that I'll be "leading a movement," Brenda, lol. If you haven't read "The Gates of Evangeline," which came our a couple years back, you might want to give it a try. It's a modern Southern gothic and very good. THAT LAST WEEKEND sounds just right for the gloom and doom of the winter ahead. I'll be looking forward to curling up with a hazelnut latte, two dogs and a cat. REBECCA is the gothic of gothics, and it's high time she had some competition. Congratulations on the upcoming release of your new book. Thanks, Ann. I have no illusions that "That Last Weekend" is going to give "Rebecca" a run for its money, although it's kind of you to say so. I think the modern sensibility, and the advent of cell phones and internet, have undermined the gothic novel, to some extent. Interesting. How do cell phones and the internet undermine the gothic novel? Since the advent of e book, i.e. instant gratification, I read far more of everything that I did ten years ago. I suppose retirement has something to do with this although my major reading time has always been from eight 'til midnight. By the way, The Incubator Trilogy e books are free on Amazon right now. INCUBATION, the first in the trilogy, is free right now, but I'm pretty sure the other two aren't. Thanks for mentioning it. It's been doing hugely well--it was #4 in Kindle books a couple weeks back. Not #4 in some sub-category, but in Kindle books overall. I can't tell you how thrilling that was. Perhaps I should be writing a dystopian gothic? Oh, ideas ambushing me . . .
Oops, you're right, but the other two in the trilogy are very affordable. How exciting, Laura! This is your first gothic, right? Do you think you'll write more? I used to love all those old novels, with dark shadows and creaking staircases. Throw in a secret passageway, and I'm in reading heaven! It is exciting, Karen. As to whether I'll write more, let's wait and see if anyone buys this one, lol. I don't know the books you refer to, Jim, but they sounds more fantasy than gothic. If you need more books on your TBR pile--I'm sure that's likely!--then start with REBECCA or MY COUSIN RACHEL (which has just been made into a movie), both by duMaurier. Laura, congratulations on INCUBATION! That is terrific news! I hope THAT LAST WEEKEND will do as well. I love this book. I grew up reading Mary Stewart, Victoria Holt, Barbara Michaels and of course the classics like Rebecca and Jane Eyre. But almost all the heroines were young, single, and at least somewhat innocent. I love that you've given us these women in their late thirties, who've lived a little and who have or have had relationships. Can you tell us a bit about what gave you the germ of the idea? Thanks for hosting me today, Debs. This book grew out of an idea that is one of the main plot twists which, obviously, I'm not going to reveal here. Once that idea popped into my head, I set about developing the relationships that would make it possible or even likely. I wanted an atmospheric setting, and had a blast coming up with the Castle of the Black Swan and its history. I didn't set out to write a gothic novel, but I'm sure some of the choices I made were informed by my reading of all the authors you list above, and others like Joan Aiken, Dorothy Eden, Phyllis Whitney, and more. Sounds delicious, Laura, but then I've come to expect good things whenever I see your name on the cover. Like Deb, I grew up reading every Mary Stewart book I could get my hands on, and I loved Barbara Michaels as well. I suspect the limitations of the gothic genre may have caused its fall from favor; every Victoria Holt novel seemed just like the one before to me, until she started writing historical fiction instead of gothics. But I'm delighted to see that former fans are now reviving and stretching the genre into new forms. I thoroughly enjoyed Susan Elizabeth Phillips' take on it, in HEROES ARE MY WEAKNESS, and now I have THAT LAST WEEKEND to look forward to, as well! I love Susan Elizabeth Phillips' books! Thanks for including my book in the same sentence with one of hers. :-) I hope you enjoy it. I think you're probably right about the limitations of the genre being its downfall. That, and perhaps a more feminist outlook that didn't appreciate the heroines' frequent helplessness and that the "prize" she won at the end of the book was usually marriage to the brooding "hero" she'd been suspecting was a murderer for half the book! I have been reading Gothic novels for many years. They are captivating, unique and have such atmosphere. Susan Howatch, Daphne DuMaurier, Sarah Waters, Jamaica Inn, and many more. Your novel sounds captivating and wonderful. Best wishes. Thank you! I'd forgotten about Susan Howatch! And I don't know Sarah Waters. I'll have to find one of her books. One of life's great delights is discovering new-to-me authors. Fingers crossed that you enjoy it, Mary. I certainly enjoyed writing it. Lovely to be introduced to a new novel. I enjoy Gothic novels since they are enthralling and intriguing. The ones that are my favorites are by Daphne DuMaurier, Kate Morton, Shirley Jackson and Deanna Raybourn. I look forward to your new release. Thank you. I enjoy all those authors you mention. Morton and Raybourn might be authors for those who are bemoaning the lack of modern gothics to try. I grew up reading Gothic novels and adored them. I think all my favorites have been mentioned, with Mary Stewart and Victoria Holt at the top of the list. I do remember reading a very twisty story by Victoria Coffman; it did not follow the formula! Deanna Raybourn wrote a fun Gothic called The Dead Travel Fast. Laura Benedict also has a Bliss House series that has Gothic elements. Anyway, hurray! Can't wait to read yours, Laura! I am adding so many books to my TBR pile today. I don't know Victoria Coffman-do you remember the title, Pat? Had to do some research. I misspoke. The author is Virginia Coffman. I think the book I remember is Moura. I was checking Amazon to figure it out. Current readers were complaining that the e-book version is poor so try to find a real book if you read it. Evidently pieces are missing from the Kindle version. I grew up reading Mary Stewart, Victoria Holt and Daphne DuMaurier. Of course the house I remember the best is Manderley. I would read all Mary Stewart and Victoria Holt's books and then start all over again. One of my favorite Victoria Holt books was Shadow of the Lynx which was a little different from her other books, and I loved My Brother Michael and This Rough Magic by Mary Stewart. I can't wait to read That Last Weekend!! My Brother Michael and This Rough Magic were my favorites, too! I remember loving Nine Coaches Waiting, and of course, Airs Above the Ground. I have read every book you mention, Celia, back in my high school/college days. I don't know what it was about those book--maybe the "feel" of them, or a feeling they evoked? That doesn't sound very writerly does it? :-) Thanks for wanting to read TLW. 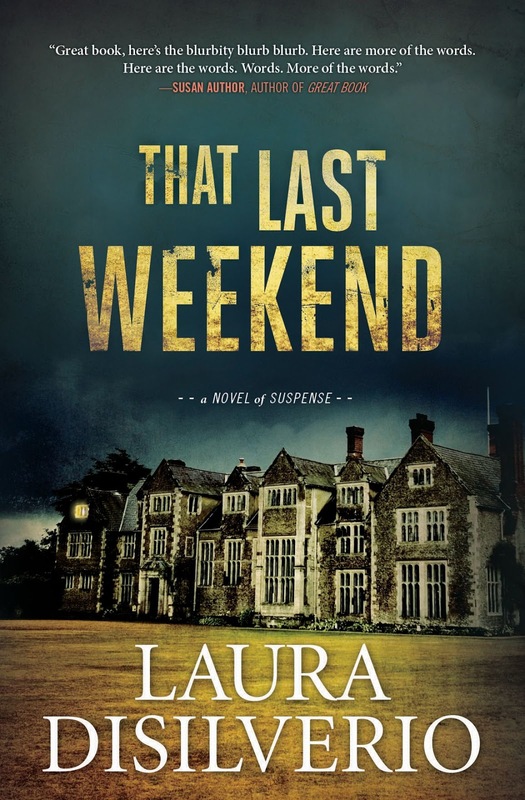 THAT LAST WEEKEND sounds like a perfect fall page turner, Laura! Not too long ago, I was reminiscing with a friend about the Phyllis Whitney books we loved as teenagers and wondering why we couldn't find something comparable these days. Sounds like your latest will fit the bill. Congrats! Oh, Phyllis Whitney, Ingrid! How could I have forgotten those! I read all the Phyllis Whitneys. One of my faves. I'll think about Fall once the temperatures drop out of the 90s and 80s. After record highs two days ago, our temps are in the 50s today in Colorado, Rick. I'm actually chilly. Fall is here (at least temporarily). This is thrilling, Laura. I still remember the first book I checked out of the adult section of the library when I was 12 - Mistress of Mellyn by Victoria Holt. I love everything about Gothic novels and can not wait to read yours. Congrats on your release! I think that was my first Gothic too. Mom would get the Readers Digest condensed books and Mistress of Mellyn was included in one of those. What a memory, Jenn. I have no idea what my first gothic was, although I remember reading Mistress of Mellyn. I should go back and re-read them all (if I can find them). I've forgotten all the plot details, I'm sure. I did re-read Mary Stewart's first not too long ago and found it disappointing, so I'm wary of going back to re-read more. I like the memories. You just got a delighted scream from me, Jenn! I was about to start my comments and saw yours first, and my lead was being young and reading Mistress of Mellyn. So, so cool! Laura, it's wonderful to see you here today. I have That Last Weekend on order and am looking forward to reading it and wishing for a nice, rainy, stormy day to do so. As I commented above on Jenn's comments, the first Gothic type book I remember reading is Mistress of Mellyn by Victoria Holt. The cover was so alluring and the story was so deliciously swirled in dark mystery that it drew me in like a moth to the flame. It was a book my mother had on the shelf, and I was so intrigued. I think I might have saved it from when we divided up our parents' estate. I'm going to hunt for it in a bit. And, of course, Rebecca by Du Maurier followed soon after Mistress of Mellyn. So, Happy Book Birthday on the 8th, Laura! That Last Weekend sounds like it's going to be quite the success. Thank you, thank you, Kathy. It's fun that so many of us come from the same reading background, no matter in what part of the country/world we were raised, and no matter how different the circumstances of our youth. Oh, my gosh, this really takes me back. I had forgotten about the "new gothic" authors and books, but I was hooked on them for quite a while. Favorite authors included Mary Stewart, Victoria Holt, and Phyllis Whitney. I'll never forget the movie based on Mary Stewart's The Moon-spinners (1964). It starred Hayley Mills and the gorgeous Peter McEnery--hmm, not sure that one even qualifies as gothic. Laura, I love your writing and am looking forward to your new book! Thanks for the compliment, Margie. I've never seen THE MOONSPINNERS movie. Maybe I can find it on Netflix. Oh Margie, I meant to mention The Moonspinners, too. I loved that movie, although I didn't read the book. I do think it had a gothic feel to it. I used to devour the Phyllis Whitney books; think I've read them all and always learned something new along the way! Looking forward to reading THAT LAST WEEKEND! Thanks for stopping by today, Judi. I hope you enjoy TLW. I loved gothics, reading these comments is like a trip back into my teenage years and young adulthood. My middle brain (don't ask, I don't know why) keeps jumping up, pointing, and yelling, "Oh, yes, oh, yes!" I too am going to have to check out THE MOONSPINNERS." I do remember it though, I'm trying to remember if that's the one where Hayley Mills had those really cool black riding boots. Does anyone else remember when Joyce Carol Oates was in her genre mode? She wrote a series of books each based on a different genre to see if she could carry it off (she did). I can't remember the title of her gothic, but it was wonderful. It was probably written in the late 80s, maybe early 90s. Laura, I have already pre-ordered your book, my index finger quirked on the word here as soon as it appeared. I can't wait for the delivery date. Best of luck with it. I'm looking forward to a great read. Thanks for ordering, TLW, Kait. I hope you love it. I didn't know Joyce Carol Oates wrote a gothic novel. What fun! I'm sure she knocked it out of the park. I loved Jane Eyre and Rebecca du Maurier! Your book sounds wonderful! I love the dark moodiness of gothic novels. I am not well read in the Gothic genre. However, I remember devouring all of Mary Stewart books. And when I was young, probably in high school, Jane Eyre and Wurthering Heights. The only downside of JungleRedWriters blog is that the TBR list becomes impossibly long. Agreed about the TBR list, David! If I never read any book other than those recommended here, I'd never be stuck for something to read. The Forgotten Garden and the other books by Kate Morton are gothic novels. (Since no one has mentioned her.) They are more nostalgic, with a sense of mystery and loss, than scary, which definitely suits me. I'm with you, Maria--scary doesn't do it for me.